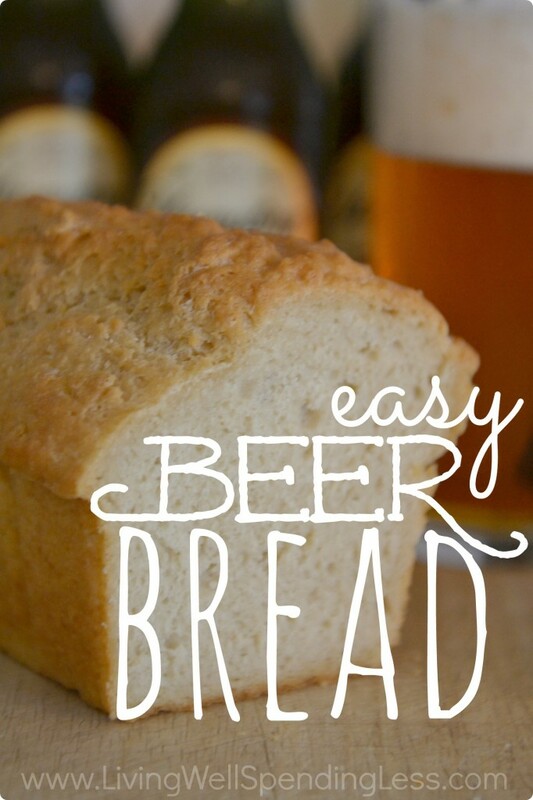 I never met a carbohydrate I didn’t love, and oh friends, let me just tell you that the day I discovered I could combine two of my very favorite carbs–beer and bread–in to one delicious (and super easy) recipe was a very happy day indeed. I’m pretty sure the heavens opened up with a bright shining light from above. Or maybe that was just in my mind. In any case, this oh-so-yummy bread recipe is very near perfection in my book–just a couple of ingredients and five minutes to whip together. It is the perfect side to any hearty soup or stew. The self-rising flour makes it just a little faster, but if you don’t keep self-rising flour on hand, just add a little salt and baking powder to the mix and you will be just fine. Step 1: Mix flour and sugar together in large bowl. 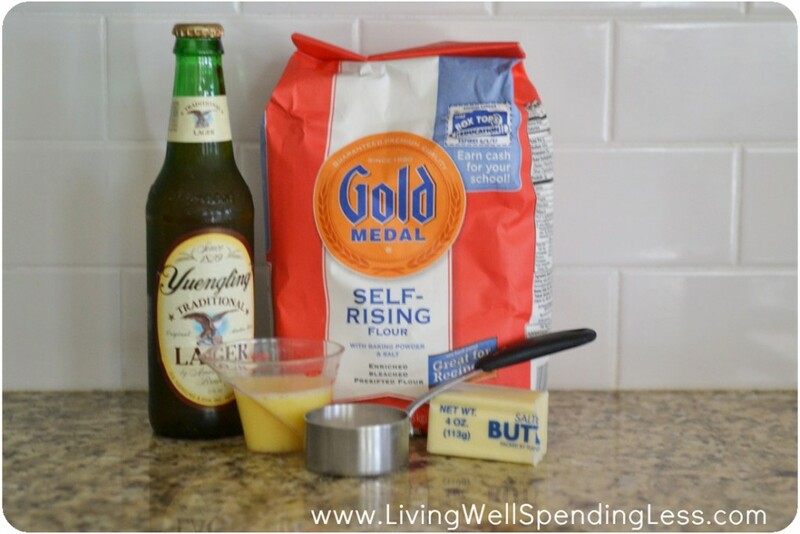 Step 2: Add beer and egg to flour mixture and mix well. Step 3: Scrape batter into greased loaf pan; bake at 350 for 50 minutes. Step 4: Remove bread from oven; melt butter. Brush melted butter onto bread and return to oven to bake 5-10 additional minutes. Crusty & delicious, this simple bread comes together fast! 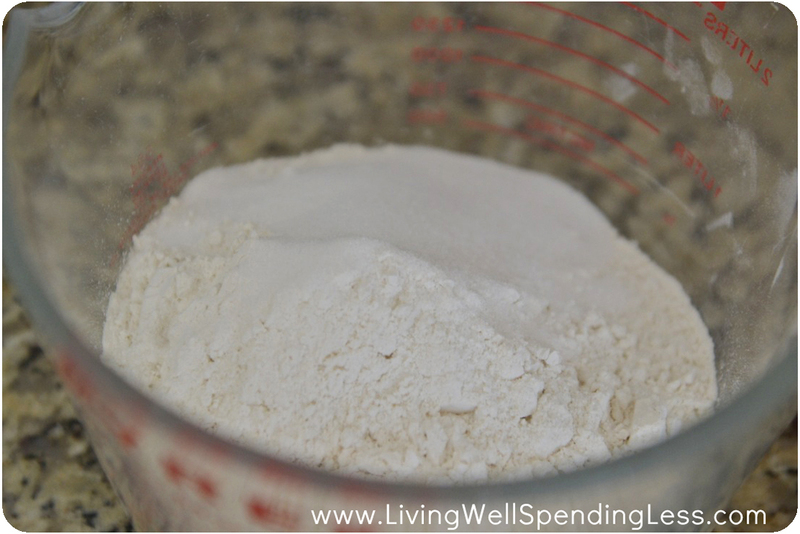 Mix flour and sugar together in large bowl. 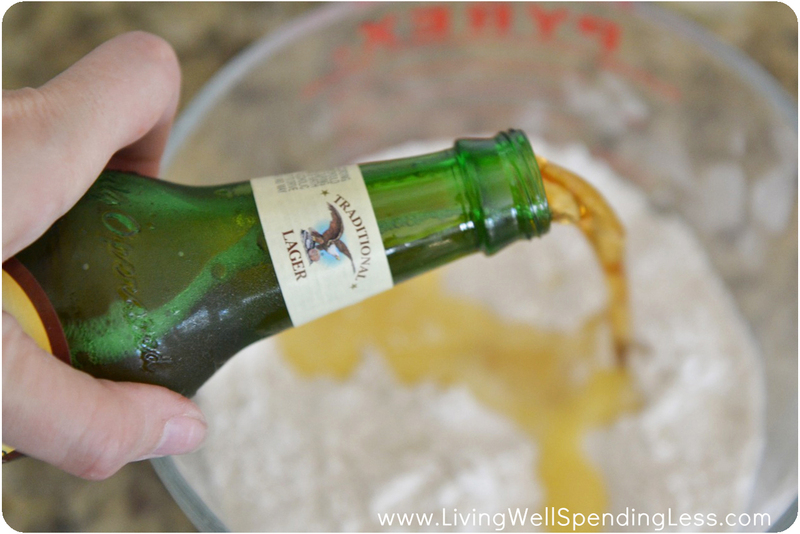 Add beer and egg to flour mixture and mix well. 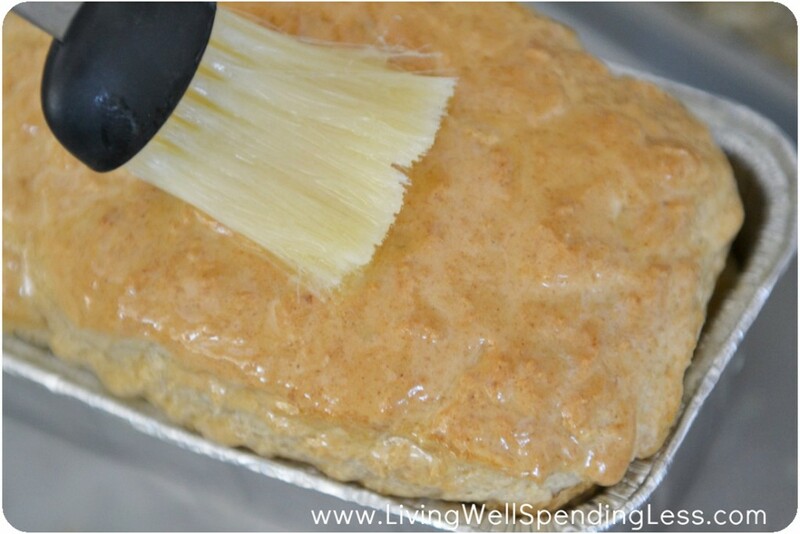 Scrape batter into greased loaf pan; bake at 350 for 50 minutes. Remove bread from oven; melt butter. Brush melted butter onto bread and return to oven to bake 5-10 additional minutes. Cool on wire rack; serve with a hearty soup or beef stew! 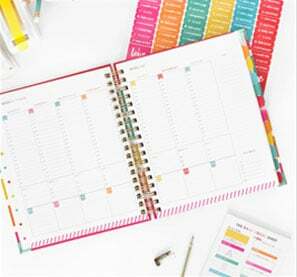 Preparation time: 5 minute(s). Cooking time: 1 hour(s). Number of servings (yield): 8. Sounds rather tasty. 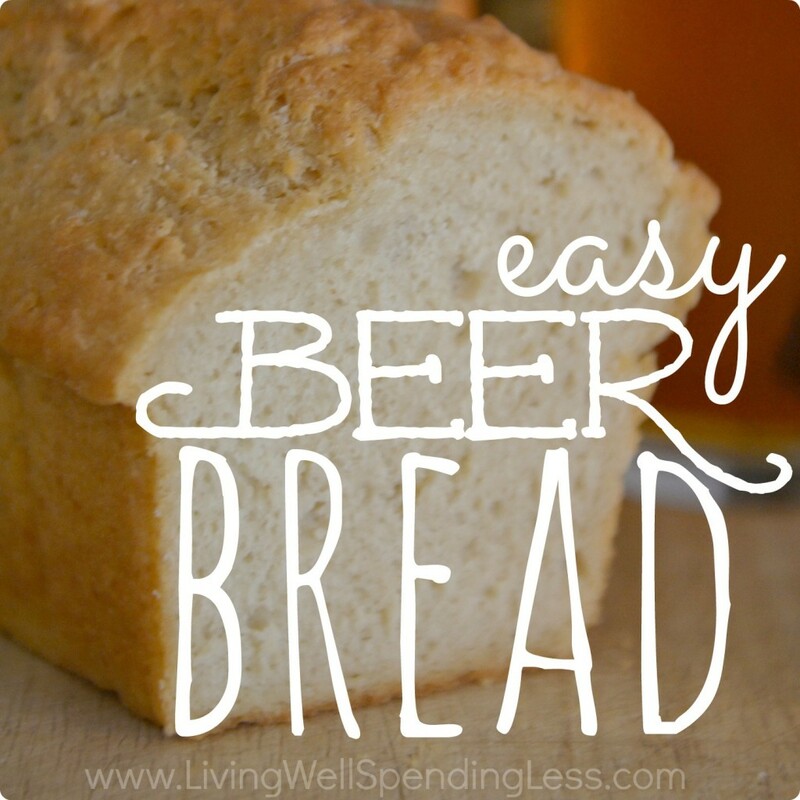 My hubbie has recently taken to making beer so I’m sure he’ll be happy to give me some to make some bread with. That’s all? Wow, looks super simple to make (and delicious too). 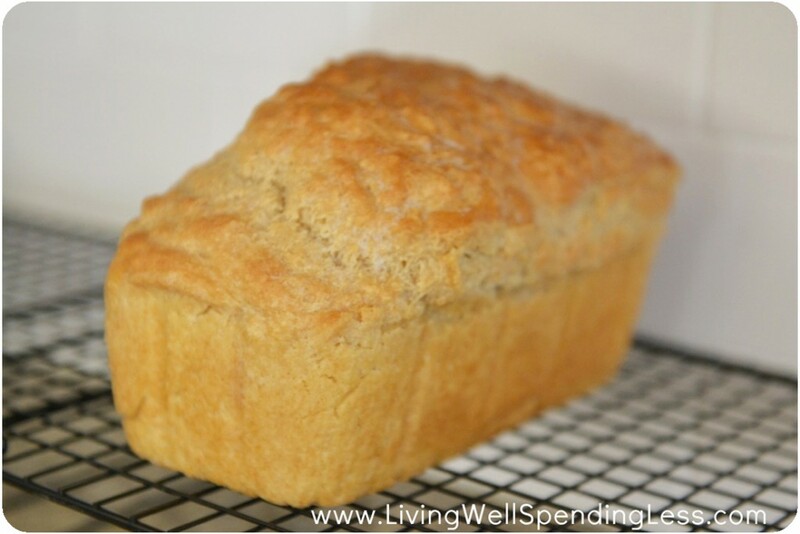 Summary: Crusty & delicious, this simple bread comes together fast! Sorry this is not what I said…guess I pushed the wrong button…dangit Sorry…..I am really gonna try this recipe saved it to my recipe box! Again Sorry!! Looks tasty! I noticed in the photo you used a Yuengling lager. Have you tried it with other kinds of beer (IPA, Stout. etc.?) Also, lucky you for being able to get Yuengling! My husband and his brother love it (they grew up in PA) but now living in the midwest we can’t get it 🙂 We always have his family bring some when they come to visit! I made this bread last night to go with a New England boiled dinner. The boil was so so, but this bread was heaven and so easy to make!! I’ve made a lot of soda breads and yeast breads, and never one I truly loved. Until this. Get out of the way, cabbage, there’s bread to be had!! Definitely going in the regular rotation. Thank you!! 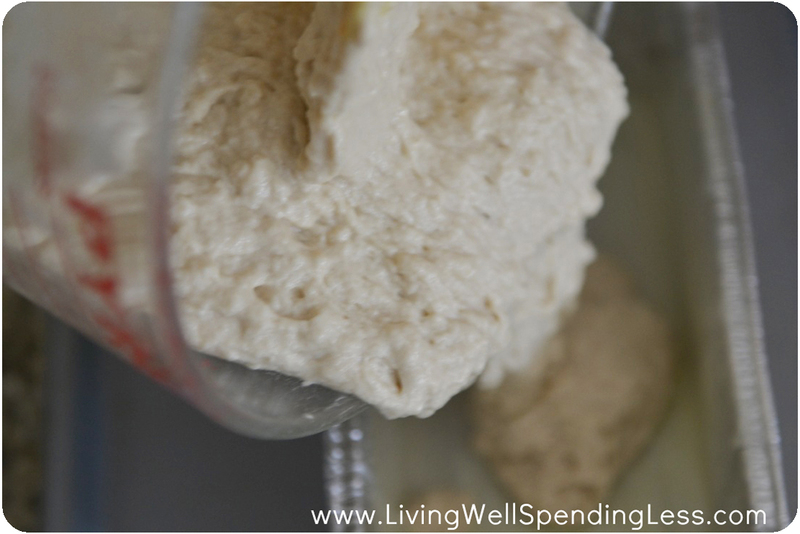 This Bread is so easy and delicious!!! Love it!! Fantastic recipe, Ruth. Just made it this morning. Super quick and easy, and slices up just like sandwich bread. Thank you! We’ve made this many times and love it!!! I would like to make mini loaves of it to give a gifts. Could you make this recipe using mini loaf pans? What would the temp of oven and bake time be? This looks and sounds so delicious! 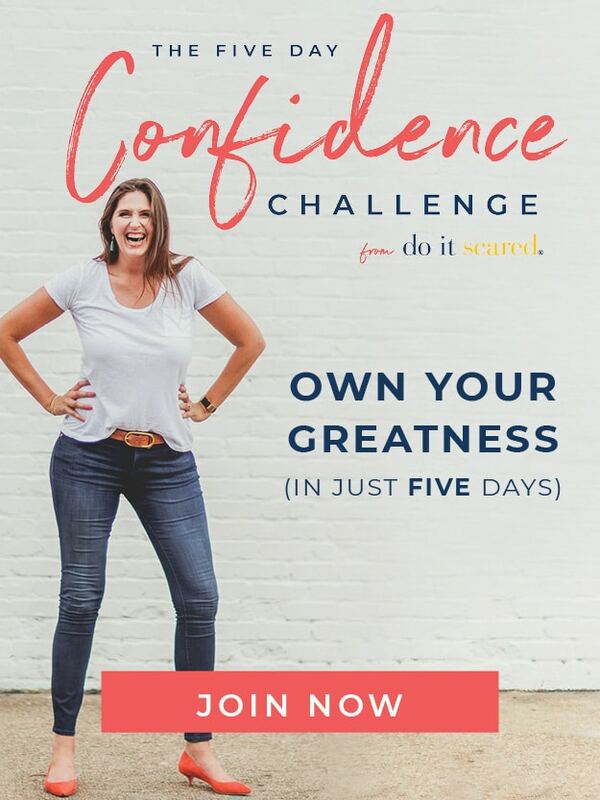 Am I understanding this correctly? This bread requires no kneading or rising time.